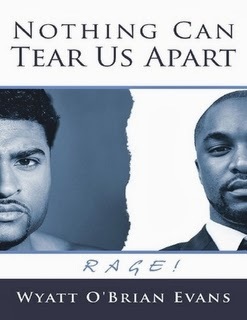 Nothing will ever tear us apart Rage is the second instalment of the Nothing Will Ever Tear Us Apart series by Wyatt O'Brian Evans. So what did I think of the book? The Novel picks up with the Narrator Wesley reeling from an unforgivable beat down handed to him by his partner and Head of Security Antonio after finding him in a compromising situation. From the outside looking in, the compromising situation looked like Antonio was cheated on in the worst way. Antonio later learns that it was a set up; Wesley was drugged by an enemy to break them apart. What the book did excellently was document the tension and emotion we all can relate to when couples go through relationship problems, and also when the couple spoke to each other, how they articulated their issues to each other well. Roll on instalment three!